Can leaving your phone charger plugged in cause a fire? Here's why it's a safety issue. Most of us are guilty of keeping our phones close to us at all times, even when we sleep. But if you actually charge your phone in bed, you might be unintentionally putting yourself in harm's way. A fire department in Newton, NH took to Facebook to warn local residents of this frightening fire hazard and if their warning doesn't convince you to keep your charger out of bed, the pictures that accompany the post sure will. An alarming photo of burned sheets and a charred charger accompanies the Facebook post, which reads: "Research has revealed that 53 percent of children/teens charge their phone or tablet either on their bed or under their pillow. This is can be extremely dangerous. The heat generated cannot dissipate and the charger will become hotter and hotter. The likely result is that the pillow/bed will catch fire." If this one hits close to home, you're not alone. According to a 2014 National Sleep Foundation poll, 45 percent of parents and 30 percent of children sleep with a tablet or smartphone in the bedroom. Of that group surveyed, 28 percent of parents and 35 percent of children admitted to sometimes leaving their devices on at night. In other words, electronics hold a deeply rooted place in our lives, even while we’re sleeping. But phone chargers themselves should always be kept out of your bed if you're looking to exercise fire safety best practices. "Generally, smartphones should be charged in locations that allow for adequate ventilation so they don’t overheat. Charging them under a pillow, on a bed or on a couch doesn’t allow for this," said Susan McKelvey, communications manager for the National Fire Protection Association (NFPA). Only buy and use devices that are listed by a qualified testing laboratory. Make sure to always follow the manufacturer’s instructions. Only use the battery and charging cord that's designed for your specific device. 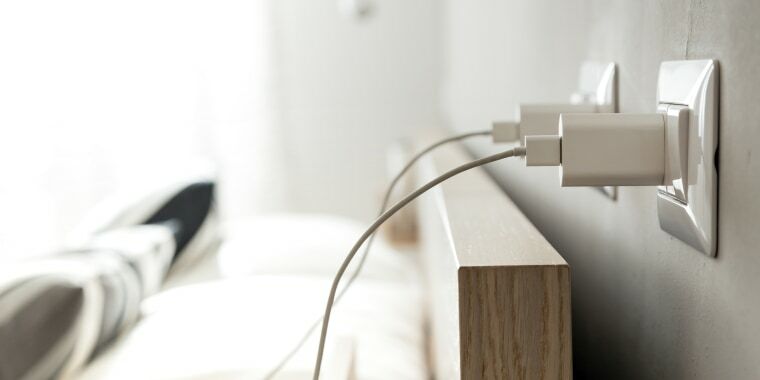 Don't charge your devices under a pillow, on your bed, on a couch or in a location that's exposed to direct sunlight. And don't forget: Aside from being dangerous, charging your phone in bed with you can also serve as a major distraction and stand in the way of that good night’s sleep you’re craving. According to the same National Sleep Foundation poll, children who always turned off their electronic devices — or kept them out of the bedroom — reported improved sleep quality over those who sometimes kept their devices on. Forty five percent of children who kept devices away from their bedroom reported excellent sleep patterns, whereas only 22 percent of children who kept devices close by got an excellent night sleep regularly. Looks like turning your bed into a no-phone zone can do more than help you catch some ZZZ.